Egmore is one of the busiest neighbourhoods of Chennai (Madras), Tamil Nadu, India. 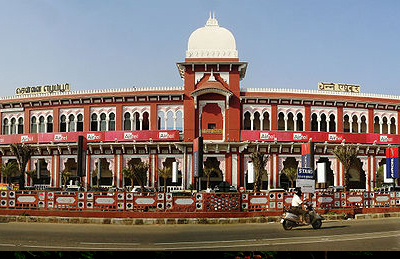 Government Museum (Chennai) founded in 1851 is located in Egmore. Egmore is served by the Chennai Egmore railway station. Egmore is the Anglicized form of "Ezhumbur" the name of a pre-British era village situated on the northern banks of the River. Despite the fact that Egmore had been a part of the East India Company's possessions since 1720, it was not until the "Golden age of British rule" stretching from 1858 to 1947 that Egmore witnessed some real growth. The Egmore Museum was one of the first notable monuments to be constructed here.The construction of this famous landmark was undertaken immediately after the Sepoy Mutiny of 1857. The Connemara Library was created as an annexure housing the Museum's vast book collection and became operational in 1896. Egmore, in 1796, was the site of the Military Male Orphan Asylum near Madras. This asylum was headed by Andrew Bell, who invented the Madras System for schooling there. The Egmore railway station is the second most important in the state of Tamil Nadu after the Chennai Central Railway Station. It was constructed in 1908 and functioned as the headquarters of the now-defunct Madras and Southern Mahratta Railway till 1951.